There is evidence of unsafe care in healthcare systems globally. Interventions to implement recommended practice often have modest and variable effects. Ideally, selecting and adapting interventions according to local contexts should enhance effects. However, the means by which this can happen is seldom systematic, based on theory, or made transparent. This work aimed to demonstrate the applicability, feasibility, and acceptability of a theoretical domains framework implementation (TDFI) approach for co-designing patient safety interventions. We worked with three hospitals to support the implementation of evidence-based guidance to reduce the risk of feeding into misplaced nasogastric feeding tubes. Our stepped process, informed by the TDF and key principles from implementation literature, entailed: involving stakeholders; identifying target behaviors; identifying local factors (barriers and levers) affecting behavior change using a TDF-based questionnaire; working with stakeholders to generate specific local strategies to address key barriers; and supporting stakeholders to implement strategies. Exit interviews and audit data collection were undertaken to assess the feasibility and acceptability of this approach. Following audit and discussion, implementation teams for each Trust identified the process of checking the positioning of nasogastric tubes prior to feeding as the key behavior to target. Questionnaire results indicated differences in key barriers between organizations. Focus groups generated innovative, generalizable, and adaptable strategies for overcoming barriers, such as awareness events, screensavers, equipment modifications, and interactive learning resources. Exit interviews identified themes relating to the benefits, challenges, and sustainability of this approach. Time trend audit data were collected for 301 patients over an 18-month period for one Trust, suggesting clinically significant improved use of pH and documentation of practice following the intervention. The TDF is a feasible and acceptable framework to guide the implementation of patient safety interventions. The stepped TDFI approach engages healthcare professionals and facilitates contextualization in identifying the target behavior, eliciting local barriers, and selecting strategies to address those barriers. This approach may be of use to implementation teams and policy makers, although our promising findings confirm the need for a more rigorous evaluation; a balanced block evaluation is currently underway. Patient safety is a global priority. An estimated 3.7% to 17.7% of patients are inadvertently harmed as a result of hospital care [1–3]. Some harm is caused by healthcare professional error arising from factors such as poor system and equipment design, and high workload [4, 5]. Other harm results from deviations from guidelines and policies; only between 50 and 70% of patients receive recommended care [6, 7]. Interventions to change professional behavior have modest and variable effects . This variability is problematic because it limits the ability to predict with any confidence whether an intervention will work for a given problem and context . The reported modest effects may be the result of problems with the ways by which interventions are selected. First, selection may be based more upon habit and disciplinary perspective than an explicit rationale that takes targeted behavior and context into account . Second, the theory underpinning healthcare professional behavior change interventions is seldom explicated, thereby limiting the ability to generalize from one context to another . Third, standardized 'top down’ interventions may lack flexibility to respond to local barriers and circumstances [12, 13]. Behavior change occurs within complex social and environmental systems that demonstrate local variations . It could be argued then that interventions to improve patient safety will be most effective when developed by those with local 'expertise’ and tacit knowledge [15–17], but which take account of evidence and external expertise. This paper describes how we co-designed interventions with local stakeholders, guided by both behavior change (impact) theory and implementation (process) theory . We selected the theoretical domains framework (TDF) of behavior change  as the 'impact’ theoretical approach for this work. The TDF was developed to rationalize and reconceptualize the theoretical constructs from multiple psychological and organizational theories of behavior and behavior change using an expert consensus and validation process. The resulting framework includes the description of the nature of the behavior to be targeted and eleven domains of behavior change: knowledge, skills, social/professional role and identity, beliefs about capabilities, beliefs about consequences, motivation and goals, memory attention and decision processes, environmental context and resources, social influences, emotion, and behavioral regulation. The framework has been used to understand barriers and levers to change in a range of contexts c.f, [20–26]. We also drew upon principles derived from implementation ('process’) theories , which provide insights into the necessary conditions for optimizing adoption and spread of interventions in practice (Table 1). This combined approach will be referred to as the Theoretical Domains Framework Implementation (TDFI) approach. The TDF has been used for designing interventions to change clinician behavior in primary care , but not in an acute setting. We describe how the TDF was operationalized using co-production and implementation principles, and applied to three UK hospitals to improve the implementation of a patient safety guideline promoting safe nasogastric feeding. We addressed two questions: How important is local context in identifying barriers and appropriate interventions to implement safety guidance? How feasible and acceptable is the TDFI approach for implementing patient safety guidance? Between April 2011 and September 2012 the Yorkshire and Humber Health Innovation and Education Cluster (HIEC) Patient Safety Theme operationalized the TDF to implement National Patient Safety Agency (NPSA) alerts (evidence-based guidelines) in four hospital Trusts (five hospitals as part of a service evaluation). Three of these hospitals (referred to as H1, H2, and H3) chose to work on an alert released in March 2011 that focussed on 'reducing the harm caused by misplaced nasogastric (NG) feeding tubes’ . Misplacement of NG tubes is not uncommon and can have serious consequences; between 2005 and 2011, there were 21 deaths and 79 cases of harm in the UK due to feeding into the lungs. Although there is no completely reliable method for checking tube placement, the guideline recommends that the first line method for confirming tube position should be to check the pH of the aspirate from the stomach. If the pH is >5.5, or obtaining an aspirate is not possible, it is only then appropriate to request an X-ray to check the tube position. The position of the NG tube is not always clear from the X-ray and therefore the risk of misinterpretation is high. Consultation with the local NHS ethics committee indicated that ethical approval was not required for this work as this project was a service evaluation focusing on NHS staff and data were collected by the teams as part of the implementation process. The exception to this was the exit interviews conducted with staff, for which ethical approval is no longer required. The HIEC team supported H1, H2, and H3 to form clinically led, multidisciplinary implementation teams focusing on the NPSA alert. To understand the nature of the target behavior, the HIEC team worked with implementation teams to co-design a tool for auditing notes of patients who had received an NG tube for the purposes of identifying to what extent guideline recommendations were being followed, and to elucidate those behaviors that might be targeted to increase compliance. We used the validated Influences on Patient Safety Behaviors Questionnaire IPSBQ;  to assess barriers to the target behavior using 11 subscales based on the TDF . Example items include: 'I am confident I can… do X target behavior’ (beliefs about capabilities); 'There is not a good enough system in place for me to…do X target behavior’ (environmental context and resources). Participants rated their level of agreement with each statement on a 5-point likert scale (1 = strongly agree; 5 = strongly disagree). Items were both positively and negatively phrased to counter response set bias. After recoding negatively phrased items, a higher mean score indicates a stronger barrier to behavior change. Developed to understand the key barriers identified in the IPSBQ, and guide staff generation of intervention strategies (Additional file 1). It contained prompts for the focus group lead to elicit discussion about key barriers, and worksheets for generating ideas for intervention strategies . A shortened version of the implementation audit tool was used to assess the first line method used to check NG tube position as part of an 18 month long audit in H1. An interview schedule was designed to assess the feasibility and acceptability of the implementation process (Additional file 2). The lead researcher (NT) kept a reflective log throughout each phase of the implementation process, describing details and consequences of key challenges faced and solutions generated. A six-step TDFI approach was tested, each step incorporating one or more of the implementation principles described in Table 1. Steps were: forming an implementation team; defining a locally relevant target behavior; understanding barriers to performing the target behavior; devising intervention strategies to address identified barriers; intervention implementation; and evaluation. The implementation principles for each step are summarized in Additional file 3. Below we focus on the use of the TDF within the implementation process. Once implementation teams had been established (step one), a locally relevant target behavior was identified (step two) through discussion about local practice and assessment of audit data. To understand the barriers to performing the target behavior (step three), with support from the implementation team, all staff involved in the target behavior (e.g., doctors, nurses, dieticians, etc.) were invited via email and/or in person to complete the IPSBQ, either online or in paper format. Data were manually entered into a spreadsheet and negatively phrased items were reverse scored. Mean domain scores were calculated for each hospital and an 11 (barrier type) × 3 (hospital) MANOVA was computed to assess differences in the barriers to implementation across the Trusts. Following analysis of IPSBQ data, focus groups were held at each hospital with multi-disciplinary staff groups from a range of wards and departments. In part one, groups were asked to consider and discuss the 11 barriers relating to the target behavior, then presented with the top four barriers found from the questionnaire data analysis, and (based on these data and their own experiences) asked to come to a consensus about the most influential barriers within their organization. In part two, to devise intervention strategies to address identified barriers (step four), focus group members discussed ideas for intervention strategies that they envisaged would be effective in addressing the most prominent barriers and achieving the target behavior. The generation of the ideas by each group was guided by the project team’s knowledge of the current literature [44–46]. Participants were provided with information about which behavior change techniques (BCTs) had been suggested as effective in addressing each type of barrier. For example, evidence suggests that appropriate BCTs to address 'lack of skill’ include 'modelling or demonstrating the behavior to individuals,’ or for individuals to 'rehearse the relevant skills.’ However, if the barrier related to 'the influence of others,’ appropriate techniques might include 'social processes of pressure, encouragement, or support’ . Focus group data were thematically analyzed using a deductive approach . Each transcript was thoroughly reviewed before extracts of text were themed according to barriers representing the pre-determined TDF domains. The key barriers emerging from the focus groups were cross referenced with those identified by the IPSBQ. Overlap and discrepancies for the top four key barriers were noted. Next, suggested intervention strategies (e.g., changes to a system, improving a protocol, using a screensaver) were matched to specific barriers identified, then mapped against BCTs [45, 48]. Once senior management granted permission in each Trust, teams were supported to implement the interventions in their organization (step five), and re-audit case notes to assess change in practice (step six). To review improvement in the targeted behavior, audit data was collected at H1 for all patients who received an NG tube between January 2011 and June 2012. Given that the extent to which practice was being recorded changed over this time period, we could not perform a formal time series analysis on this data . However, criteria suggested by Perla, Provost, and Murray  were used to detect 'signals’ within the data, which can indicate if a process is demonstrating non-random patterns. Implementation team members who had been involved in the project from the beginning (n = 5) were approached by an independent interviewer and asked if they would participate in a short telephone interview to discuss their experiences of the process. Inductive thematic analysis was undertaken to identify key emerging themes relating to the acceptability and feasibility of the TDFI approach. A reflective log was recorded to capture the challenges presented and solutions generated throughout this process in order to provide an insight into the feasibility and acceptability of the TDFI approach. The solutions were themed according to the ten implementation principles stated in the introduction and mapped against each implementation step. Following discussions with the implementation teams and ward staff, and assessment of audit results (Table 2), each hospital decided that the target behavior for change would be for staff to check pH first line. *p < 0.01; **p < 0.05 for MANOVA results of differences between reported barriers in each hospital. NB: Mean scores for individual hospitals were computed following initial reliability analysis on each dataset; mean scores were taken from analysis for the combined data set following missing values analysis (prior to confirmatory factor analysis, results of which are reported in . An 11 (barrier type) × 3 (hospital) MANOVA indicated that there was a main effect of hospital on the strength of barrier types reported F (2, 224) = 2.88, p <0.001, d = 0.77. Between subjects effects demonstrated significant differences between hospitals for three of the 11 barrier types: 'knowledge’ F (2, 224) = 4.59, p <0.05, d = 0.40, 'skills’ F (2, 224) = 4.17, p <0.05, d = 0.39, and 'emotion’ F (2, 224) = 9.79, p <0.001, d = 0.59. Further inspection of pairwise comparisons indicated that significant differences were found between H1 and H2 for 'knowledge’ (mean diff = 0.304, p <0.05) and 'skills’ (mean diff = 0.274, p <0.05), and between H1 and H2 (mean diff = 0.343, p <0.001), and H2 and H3 (mean diff = 0.402, p <0.05) for 'emotion.’ No significant differences between organizations were found for the other reported barrier types. Details of focus group participants are provided in Additional file 1. The introduction and explanation of the barriers to using pH as the first line method to checking NG tube position from the IPSBQ prompted focus group participants to reflect on some of their own experiences relating to this target behavior. For the most part, the top four barriers identified by the IPSBQ emerged from the focus group data (Table 4). For H3, there was one discrepancy for the fourth strongest barrier. Table 5 provides examples of the responses of staff (key barriers and intervention suggestions) mapped against TDF domains. 'If my boss told me to do one it would be very difficult for me to, depending on which the boss was, generally you’d be like no but don’t you know that local guidelines are…they’d be like I said get a chest x-ray, you’d be like oh alright’ (Junior doctor, H1). 'Well you’ve got to bring the consultants on board…I think it needs a big cascade…we could have it as a screen saver (Junior doctor, H2). 'If at one point during a couple of weeks all the screen savers had something about NG tubes, a load of posters and then there was sort of a couple of meetings or something…what you want to do its just to raise awareness and people will actually think about it a lot more and that’s what you can hope for’ (Consultant, H2). 'They [nurses] always justified it with 'we’d rather get an x-ray, we’re told not to feed without an x-ray.’ I pushed a couple of times, when I was very confident, when it had gone down very easily it was very acidic…but quite frequently they’d still send for an x-ray or they’d get someone else to request the x-ray, you know, they were adamant they wanted the x-rays and wanted them reported’ (Junior doctor, H2).
' What I’ve identified……is that I get newly qualified staff nurses coming through who have never been taught this as a method of checking, don't know how to check it’ (Dietician, H3). 'The Trust should to do teachings about the use of ph paper vs x-ray, rather than just bombard staff with information’ (Junior doctor, H1). 'Specific training should be targeted to relevant groups rather than lots of different types of mandatory training’ (Operation Department Practitioner, H1). 'I think a lot of it is to do with the training, I was talking to a few junior doctors in respiratory and a lot of them haven’t even heard about the training package on the website, but they’re putting tubes down.’ (Nurse, H2).
' I think the (e-learning) package would be good…If its interactive people are more likely to do it’ (Junior doctor, H2). '…people just aren’t checking the aspirate and we almost need to get them to just check and then even if they are unsure, fine send for an x-ray, but if you see that those then correlate and you see that more and more often, then your confidence might increase.’ (Junior Doctor, H2). 'Another way to bring it across would be to have a teaching event or something’ (Nurse, H2). 'I think confidence would increase if staff knew they were learning the correct skills’ (Senior nurse, H1). 'We’re still having problems getting strips; was looking for some this morning and there weren’t any in the cupboard so I had to pinch some from another patient’ (Junior doctor, H1). 'Can you get it in the packs? Like the IV catheter packs? You’ve got all the stuff for your aseptic technique…maybe you need a similar NG pack so people don’t forget that here’s your 20 ml syringe that you aspirate with; here’s your litmus paper…’ (H2: junior doctor). 'I believe that some of the problems come about where to document it…so it's getting the pH and where do you document that…’ (Nurse, H3). 'Someone developed these catheter packs that have all the equipment you need. Could there not be an NG tubes pack with all the necessary equipment for everyone to follow in a specific order?’ (H1, junior doctor). 'I think the nurses are still quite anxious because it’s so big even now I think they’re still anxious about pH and they just want to know that it’s in the right place’ (Junior doctor, H1). 'We could provide junior doctors with information about the use of x-rays and potential problems these cause’ (Junior doctor, H1). I think there is very much a fear isn’t there, once you can’t get that thing back it’s, you know… (Nurse, H2). 'I would look at it as I went past if it was an x-ray…because a lot of questions that come from the requirement for x-rays are not seen by the people who interpret the x-rays so I think that (a poster with information regarding misinterpretation of X-rays) would be really good’ (Junior doctor, H2). Examples of intervention suggestions matched to quotes representing barriers from specific TDF domains are presented in Table 5. Strategies authorized, developed, and implemented across the three Trusts are presented in Table 6. These strategies are mapped alongside the main identified barriers for each Trust, as well as the BCTs that have been suggested as appropriate for addressing specific barriers . *Only implemented as part of the intervention in H2; ** H3 did not have the resource to provide this intervention; ^ = H2 chose not to implement this strategy. Trust A audited 301 case notes over 18 months to assess the first line method used to check the position of NG tubes following initial insertion. Fifty seven sets of notes were discarded because patients had received a different tube (n = 34) or came into hospital with the ng tube in situ (n = 6), the tube was not inserted (n = 8), notes were unclear (n = 7), or the tube was placed endoscopically (n = 2). The number of included sets of notes per month ranged from nine to 22 (Figure 1A-C). According to Perla, Provost, and Murray , Figure 1A-C demonstrate positive 'signals’ in the form of 'shifts’ (six or more consecutive points either all above or all below the median). These positive patterns are supported by the pre-post intervention data (mean percentages for nine months pre-intervention, and nine moths post) which indicates an increase in the use of pH first line from 11% to 60%, a decrease in X-ray from 60% to 37%, and a reduction in the percentage of time practice was not documented (30% to 3%). The Trust interpreted these results as clinically significant. Time trend for use of pH as first line method used to check tube position. 1A: Use of pH as first line method to check tube position. 1B: Use of X-ray as first line method to check tube position. 1C: First line method to check tube position not documented. Five telephone interviews were undertaken across the Trusts (H1 = advanced nurse practitioner, and junior doctor, H2 = consultant in care of the elderly, and junior doctor, H3 = gastroenterology consultant) following intervention implementation. Each interview lasted 10 to 20 minutes. Two key themes emerged that directly related to the feasibility and acceptability of this approach, which were: benefits and challenges of the approach; and sustainability (Table 7). 'I guess one of the key things has been the (HIEC team) input; this takes the pressure off the clinicians…without that it wouldn’t have worked so well’ (Consultant, H2). 'I suppose it’s the behavioral change aspect which was the driving force’ (Consultant, H3). 'I have had no previous experience in focus groups and that was really where we got most of the ideas for the implementation strategy; it was really useful (Junior doctor, H2). 'It’s got the support of the Deputy Medical Director, it’s really meant that you can have that impact, it’s trust-wide and region-wide as well, whereas normally just a junior doctor doing an audit, it wouldn’t really have that precedence or support or anything (Junior doctor, H2). 'Although (through the HIEC team) there’s been a resource to draw on, I do feel overall it would be better to get more hands on deck’ (Consultant, H3). 'One of the challenges has been co-ordinating the implementation strategies and actually working with different teams in the hospital like the illustration department, the photographers, the communication experts and the print unit, trying to get everything delivered in a timely manner (Junior doctor, H2). 'I’ve also spoken at the regional audit meeting with all the foundation trainees about how being involved in a project where you’ve got frontline staff leading it but with top down support, how you can make a real difference’ (Junior doctor, H2). 'The knowledge that every other Trust is going through the same issues and wants to improve does create a bit of a network so H1, H2, and H3 are all talking about how to solve this problem’ (Nurse, H1). 'For me it’s made me see patient safety in a different aspect like from a much broader base and realising that actually as a junior doctor you really can make a huge difference’ (Junior doctor, H2). Perceived benefits of the TDFI approach included the support provided from the HIEC team, the use of behavior change methods throughout the project, and the wider impact the work had within organizations, in comparison to previous safety initiatives that participants had been involved in. Challenges included having to generate interest and involvement across different areas of the Trust, and coordinating groups of people involved in intervention development and/or delivery (e.g., medical illustrations, procurement). Participants described the potential for sustainability of the findings and the approach because: networks had been created and there was greater sharing between professionals and across hospitals, and enthusiasm among healthcare professionals for improving patient safety had been generated. The reflective log analysis produced a matrix of the TDFI approach (Table 8) that outlined the implementation steps (the 'what’) against the implementation principles (the 'how’). Context-specific examples of how each implementation principle (see Table 1) was used in stages of the process are provided. Encouraged IT to distribute IPSBQs to colleagues and encourage completion; fed back findings to IT, clinical governance, junior doctor training, etc. Timing of FGs arranged to encompass competing priorities for attendees; LSs accounted for existing systems, equipment, resources, staff, etc. We have demonstrated a process for developing and implementing theoretically derived, co-designed and context-specific interventions in healthcare organizations. This is the first study to use the TDF to directly inform intervention design in an acute setting, and to outline how specific implementation principles can facilitate the use of the TDF for eliciting behavior change in healthcare settings. This study highlights the importance of local context in identifying barriers and designing and implementing appropriate interventions, and the feasibility and acceptability of the TDFI approach. There were differences in the key barriers reported among the three organizations, suggesting that local context might have affected perceptions about the challenges faced in complying with a patient safety guideline. We found significant differences between hospitals for three of the domains (knowledge, skills, and emotion); however, there was overlap in the top three barriers identified. For all hospitals, the mean scores for barriers were low, despite poor compliance with recommendations in practice—this could represent a tendency for staff to underestimate the barriers to behavior change, or to respond in a socially desirable way; nonetheless, the relative values between each domain within each organization demonstrate differences in perceptions of barriers, which is important for the purpose of tailoring interventions. Although some key barriers identified were the same across each Trust (e.g., social influences, environmental context and resources), the detail provided about these barriers in focus groups varied somewhat (e.g., for 'environmental context and resources,’ some staff referred to a lack of adequate documentation, others mentioned how they were unable to easily access pH paper), as did the interventions implemented to overcome these barriers (e.g., to combat the pH paper issue, H2 designed an NG pack that included all the equipment, and H1 worked very closely with procurement to ensure the correct pH strips were available on every ward). The time and resources available to dedicate to this area of improvement in each organization also affected the type of interventions implemented and the degree to which they were developed. For instance, H2 generated an interactive e-learning resource which included video clips of medical staff modelling the entire NG tube procedure—this was achieved due to a dedicated implementation team, who formed working relationships with non-clinical departments (e.g., IT, medical illustrations). In H3, however, IT services were limited and, as such, generating an e-learning package was not possible—instead, to encourage sharing, staff were directed to the H2 e-learning package through posters and screensavers implemented within H3. These examples demonstrate the advantages of adopting the perspective of the target group c.f, , using a flexible approach c.f, , and incorporating interventions into established structures c.f, [27, 51]. Although these implementation principles were used and can be identified in the results of the reflective log analysis (Table 8), using the approach did not come without difficulties, such as resistance to change or a perceived lack of time. Generally, perceptions of the feasibility and acceptability of the TDFI approach appeared positive; interviewees indicated that the outcomes so far for their organization (e.g., engaging in patient safety work, spreading knowledge) were beneficial. Challenges of this approach included having to gain commitment from staff (e.g., building an implementation team, eliciting contributions from non-clinical departments). However, it is possible that these types of challenges are not exclusive to this approach, but are more common observations of work aiming to produce large scale change within a complex organization . Interviewees expressed appreciation for the HIEC team support throughout the process, and recognized the benefits of holding focus groups to co-design interventions, suggesting that the blend of theoretical support and clinician context expertise  worked well. While this feedback suggests that it is feasible and acceptable to use the TDF with healthcare professionals to drive behavior change for patient safety, the support required to ensure teams maintained momentum was resource intensive, and this is highlighted in the results of the reflective log analysis. Irrespective of this point, the positive aspects of this approach for sustainability were evident, including the forming of intra- and inter-organization networks working together on areas of patient safety , and the spread of enthusiasm for patient safety work by champions . Collection of time trend data was also feasible. 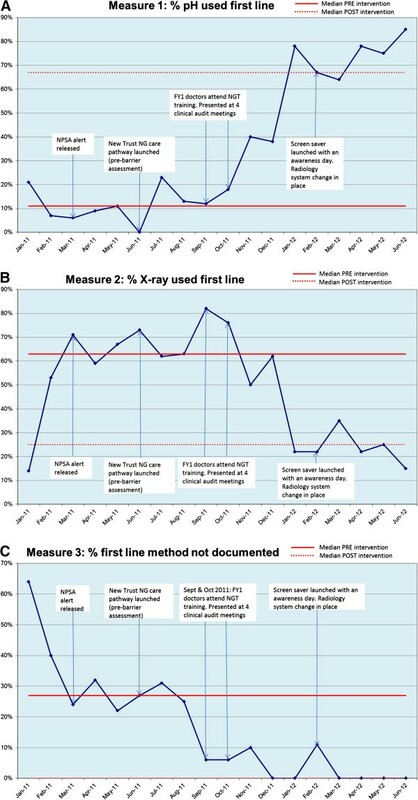 Although we could not perform formal statistical analysis (i.e., time series analysis) given data limitations mentioned earlier, the Trust A audit suggested that 'shifts’  occurred for improved documentation of practice and use of pH first line, and decreased use of X-ray first line, following intervention implementation. Furthermore, the pre-post intervention data indicated clinically significant improvements in practice for all three measurement outcomes. These improvements may be associated with the implementation of the intervention strategies, e.g. brief practical training provided for junior doctors (skills; beliefs about capabilities), the presentation of information to senior members of staff at clinical audit meetings (social influences), screensavers and posters (emotion; social influences), and the radiology system change (environmental context and resources; social influences). More formal evaluation methods are needed to establish causation [49, 55]; however, these findings indicate potential for co-designing theoretically underpinned interventions to address specific barriers to behavior change for patient safety. There are two main limitations to our methods. First, participating hospitals were volunteers and therefore may have been more likely to complete the process. However, simply receiving agreement for participation by a medical director did not automatically lead to continued involvement from front line staff. Furthermore, audit data indicated the participating trusts were experiencing issues with guideline implementation that are similar to those faced by others. We also examined a single patient safety alert so, as yet, the extent to which it is possible to use the TDFI approach for other alerts/guidance is unknown. In addition, the number of exit interviews undertaken to understand perceptions of feasibility and acceptability was small (n = 5). Finally, the time trend data was collected only for a single Trust. Pre-post intervention implementation data is being collected for all three Trusts, which we are attempting to compare against retrospectively collected control data. Second, identifying the successful components of this approach and of the specific interventions on behavior change will also be challenging. For example, at this early stage of development and feasibility testing, it will be difficult to understand the extent of the benefits of using the TDF as part of an approach to implement patient safety guidance in an acute setting, compared with simply providing additional support for implementation. Furthermore, given the range of interventions used to address key barriers, it will be difficult to identify which BCTs have led to change, and whether any change occurred as a result of mediating perceived barriers. Nonetheless, the interventions used have been designed using underlying theory and reported explicitly to enable replication. Future research should address these limitations by evaluating the TDFI approach within a rigorous randomized control design across more hospitals. There is also scope for using factorial study designs that evaluate combined and separate intervention components (e.g., using the TDF and implementation principles separately), to improve understanding of effects. In addition, it will be important to further refine and test the IPSBQ with larger sample sizes to clarify and improve sensitivity in identifying key barriers to behavior change within organizations, or indeed to establish whether variation genuinely exists as a function of local context. The outcomes of this work include a framework for the implementation of patient safety guidelines which consists of a) a set of tools to identify context-specific target behaviors to address, barriers to improvement, and theoretically underpinned strategies to overcome barriers, alongside b) a set of implementation principles to guide use of these tools with organizations. The TDFI approach and the associated resources may be of use in other healthcare organizations and to guideline implementation teams and policy makers, especially if the post-intervention data from the three Trusts indicate changes in behavior in comparison to control sites. It is feasible and acceptable to combine theory-driven and co-design approaches in the development of strategies to support the implementation of an evidence-based patient safety guideline. The impact of local context and value of local expertise should not be under-estimated. Future work should replicate or adapt theory-driven, co-designed interventions and evaluate their effects within rigorous designs. NT and RL have previously worked on projects that involve using the TDF framework to identify barriers and design interventions using theoretically underpinned behavior change techniques to design tailored interventions to address key barriers for a range of health behaviors. RL conceived the original idea for using the TDF to implement NPSA guidelines. NT developed the TDFI approach. BS is an organizational psychologist who has drawn upon her knowledge and experience of implementation science to contribute to this work. RF is a general practitioner and implementation researcher, and is also the Deputy Editor of Implementation Science; all decisions on this manuscript were made by another editor. We would like to acknowledge each member of our Implementation Teams from the three participating Trusts for the time they spent working to implement the NG tubes guideline in their organization. We would also like to acknowledge Marta Santillo for conducting and analysing the exit interviews for this study, and Sally Moore and Dr Lorna Peach for collecting the time-trend audit data. NT led the design and coordination of the study, performed the statistical analysis, and led the writing process. RL participated in the design of the study, and helped to draft the manuscript. BS participated in the design of the study, and helped to draft the manuscript. RF helped to draft the manuscript. All authors read an approved the final manuscript.